Whether you have a couple of hours, a few days or a blissful week to spend in Denver, there are outdoor adventures galore. And you can rent all sorts of gear, from kayaks to motorized scooters, without having to pack a huge suitcase or buy expensive stuff. Here&apos;s a rundown to get you up and running. Located on Sante Fe Drive, Denver Outdoor Adventure Company helps make memories with family-friendly adventures. Single and tandem kayak, tube, hiking gear and snowshoe rentals are available for do-it-yourselfers. You can even rent hammocks to take along of for a lazy day in the park or nearby foothills! Join Denver Outdoor Adventure Company for a Mountain Glow Paddle at Chatfield Reservoir on several select Saturday evenings and Scenic Sunset Paddle on Sloans Lake on most Friday nights (both offered May through September). Other options include a Chatfield Paddle and Deer Creek Canyon Hike combo or treks that are hiking or snowshoeing focused. This family owned and operated business helps inspire love for the outdoors and makes it easy for people of all ages and backgrounds to enjoy nature. Located on Glencoe Street, Outdoors Geek is a one-stop resource for renting a tent and other individual items, camping packages, backpacking packages and high-end glamping setups. The company even ships rental gear almost anywhere. The Outdoors Geek team tests all gear sold and rented, regularly sets up and concierges 100-plus tent locations, and has penned helpful checklists and geek advice articles on its website. Staying in the heart of the city doesn’t mean adventure is beyond reach, especially with Confluence Kayaks, located across from the Downtown Aquarium and next to the whitewater chutes of the South Platte. With more than two decades serving Denver&apos;s kayak, ski and bike aficionados, Confluence Kayaks provides lessons, rentals, outfitting and gear for sale. River trips are offered May through August with no experience necessary, and there are bike tours…either the super quick 30-minute version that comes with a 3-hour bike rental or a longer version that stitches together riverside bike paths, city bike lanes and neighborhood streets for a 10-mile outing. Or rent bikes for a half day, full day, overnight or weekend and take a spin on nearby greenway trails or in surrounding towns and mountains. Make a reservation with ScooTours Denver Scooter Rental and pick up your rental wheels “in the shadow of the Big Blue Bear” across the street from the Colorado Convention Center (CCC) downtown. 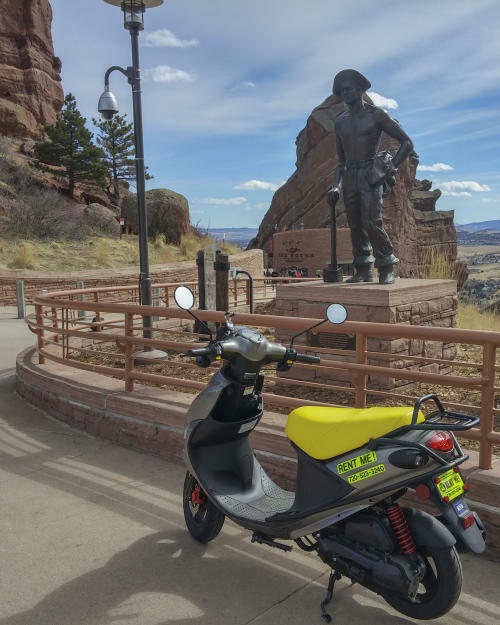 Tooling around on a colorful, motorized Vespa-style scooter is a fun way to explore The Mile High City or scoot into the foothills for a day trip. Lessons, a helmet, goggles, insurance, ideas for routes and all the gas needed is included in the rental of ScooTours’ fuel-efficient 50cc two-wheelers. Guided sightseeing tours begin at the Blue Bear sculpture and cover several Denver highlights over a two-hour period such as Confluence Park, LoDo, LoHi, Denver Union Station, Colorado State Capitol, Molly Brown House Museum, Governor&apos;s Mansion, Cherry Creek North, Washington Park and Denver Museum of Nature & Science. It doesn’t take long to notice the more than 82 bike stations that are docking points for approximately 700 shiny red bikes that can be rented on the spot. Denver B-cycle is a people-powered, automated bike-sharing system designed for short trips around the city. Keep each ride under 30 minutes (e.g., go from your hotel to a Colorado Rockies game at Coors Field or to a yummy brunch spot your friend recommended), and you won’t be charged anything other than the access pass purchased. Basically, you ride the bike when you need it and check it back into any B-cycle station when you don’t. The bikes fit all sizes and are equipped with pedal-powered lights, a bell, a basket and a lock. There is even an app to check out bikes (or use your credit card at the bike stations), find station locations, check bike availability and get directions. When in Denver, act like the locals do…savor the outdoors, 300 days of annual sunshine and beautiful surroundings. Located at the confluence of Cherry Creek and the Platte River, REI’s 95,000-square-foot flagship Denver store occupies the historic Denver Tramway Power Company Building (built in 1901) near the Downtown Aquarium. Going to the store is an experience itself with a kayak course nearby to test equipment, huge indoor climbing rock, auditorium for outdoor-themed classes, rental and repair shops, and even a Starbucks. The rental shop stocks camp stoves, tents, sleeping bags and pads, backpacks, mountaineering gear, paddling and Nordic skiing equipment and snowshoes. Make sure to scope out the calendar of events for the Denver and other metro area REI stores for classes and outings related to mountain biking, bike maintenance, off-trail map and compass navigation, climbing, stand-up paddle boarding, photography, backpacking basics, family camping trips and more. Photos courtesy of Denver Outdoor Adventure Company and ScooTours Denver Scooter Rental.